"Independence, freedom, (the) Islamic Republic"
Iran ( Persian: ايران‎ ​, Īrān), officially the Islamic Republic of Iran ( Persian: جمهوری اسلامی ايران‎ ​, transliteration: Jomhūrī-ye Eslāmī-ye Īrān), and formerly known as Persia in the West, is a southwest Asian country located in the Middle East. Iran borders Armenia, Azerbaijan (including its Nakhichevan exclave) and Turkmenistan to the north, Pakistan and Afghanistan to the east, and Turkey and Iraq to the west. In addition, it borders the Persian Gulf, across which lie Kuwait, Iraq, Saudi Arabia, Bahrain, Oman, Qatar, and the United Arab Emirates. Shi'a Islam is the official state religion and Persian the official language. Throughout history, Iran has been of great geostrategic importance because of its central location in Eurasia. Iran is a member and co-founder of the United Nations, NAM, the OIC, and OPEC. Iran is also significant in international politics on account of its large supply of petroleum. The name Iran is a cognate of Aryan and literally means "Land of the Aryans." Map of the world by Eratosthenes, c.200 BCE. In antiquity, the names Ariana (Āryānā) and Persis were used to describe the region where modern-day Iran is found. 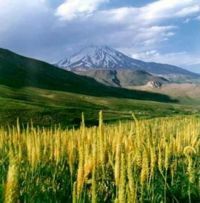 In former ages, the names Āryānā and Persis were used to describe the region which is today known as the Iranian plateau. The earliest Iranian reference to the word (airya/arya/aryana etc), however, predates the Iranian prophet Zoroaster (est. anywhere between 1200 to 1800 BCE, according to Greek sources, as early as 6000 BCE and is attested in non- Gathic Avestan; it appears as airya, meaning noble/spiritual/elevated; as airya dainhava (Yt.8.36, 52) meaning the land of the Aryans; and as airyana vaejah, the original land of the Aryans. Stonecarving from Persepolis showing Darius I the Great of Persia (521-486 BC). "I am Persian, son of a Persian; an Aryan, having Aryan lineage." In Parthian times (248 BCE – 224 CE), Aryanam was modified to Aryan. In the early Sassanid Period (224–651 CE), it had already evolved to Middle Persian Ērān or Ērān Shahr which finally resulted in New Persian Iran or Iran Shahr. At the time of the Achaemenian empire, the Greeks called the country Persis, the Greek name for Pars (Fars), the central region where the empire was founded; this passed into Latin and became Persia, the name widely used in Western countries which causes confusion as Persia is actually Pars (Fars) province. In the twentieth century, a dispute arose over whether Iran or Persia is the correct name for the country. On 21 March 1935, the ruler of the country, Reza Shah Pahlavi, issued a decree asking foreign delegates to use the term Iran in formal correspondence in accordance with the fact that "Persia" was a term used for a country called "Iran" in Persian. Opponents claimed that this act brought cultural damage to the country and separated Iran from its past in the West. The 1979 Revolution led to the establishment of the present day theocracy that is officially called the Islamic Republic of Iran, but the noun Persia and the adjective Persian are still commonly used. 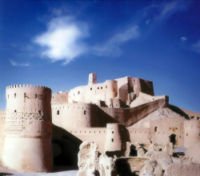 The Arg-e Bam citadel, built before 500 BC. Parthia was led by the Arsacid dynasty, who reunited and ruled over the Iranian plateau, taking over the eastern provinces of the Greek Seleucid Empire, beginning in the late 3rd century BCE, and intermittently controlled Mesopotamia between ca 150 BCE and 224 CE. It was the second native dynasty of ancient Iran ( Persia). Parthia (mostly due to their invention of heavy cavalry) was the arch-enemy of the Roman Empire in the east; and it limited Rome's expansion beyond Cappadocia (central Anatolia). The Parthian armies included two types of cavalry: the heavily-armed and armoured cataphracts and lightly armed but highly-mobile mounted archers. For the Romans, who relied on heavy infantry, the Parthians were too hard to defeat, as both types of cavalry were much faster and more mobile than foot soldiers. On the other hand, the Parthians found it difficult to occupy conquered areas as they were unskilled in siege warfare. Because of these weaknesses, neither the Romans nor the Parthians were able to completely anex each other. The Parthian empire lasted five centuries, longer than most Eastern Empires. The end of this long lasted empire came in 224 CE, when the empire was loosely organized and the last king was defeated by one of the empire's vassals, the Persians of the Sassanian dynasty. The 2500 year old ruins of Persepolis (Old Persian: Parsa'; New Persian: Takht-e Jamshid). The Sassanian Empire in 602-629 AD (green) and areas under Sassanid military control (striped). Before the Islamic conquest of Persia, Zoroastrianism was the national religion of the Sassanian Empire of Persia, and played an important role in the earlier Achaemenian and Parthian dynasties. The Iranian Prophet Zoroaster is considered by numerous scholars as the founder of the earliest religion based on revealed scripture. Many scholars point out that Judaism and subsequently, Christianity and Islam have borrowed from Zoroastrianism in regards to the concepts of Eschatology, Angelology and Demonology, as well as the fallen angel Satan, as the ultimate agent of evil; some suggest it might have been a process of mutual influencing. Zoroastrian monotheism has had major influence on the religions of the Middle Eastern monotheisms in adaptations of such concepts as heavens, hells, judgment day and messianic figures. These concepts (amongst many others) reflect the extreme dualism of Persian culture which has influenced Eastern and Western civilization. According to Professor Mary Boyce, who was the world's leading doyenne of Zoroastrian studies and Iranology, Zoroastrianism is the oldest of the revealed credal religions, and it has probably had more influence on mankind, directly and indirectly, than any other single faith. Nonetheless, claims of Zoroastrianism influencing ancient Jewish (and subsequent Christian) thought are disputed by other scholars or explained by the mutual influencing phenomenon. Despite its heavy persecution of Christians during the fourth century, fifth century Zoroastrian Iran became a haven for Nestorians fleeing Christian territories that supported the Council of Ephesus. As a result, the Assyrian Church of the East was formed. The first Shah of the Sassanian Empire, Ardashir I, started reforming the country both economically and militarily. The empire's territory encompassed all of today's Iran, Iraq, Armenia, Afghanistan, eastern parts of Turkey, and parts of Syria, Pakistan, Caucasia, Central Asia and Arabia. During Khosrau II's rule in 590-628, Egypt, Jordan, Palestine and Lebanon were also annexed to the Empire. The Sassanians called their empire Erānshahr (or Iranshæhr, "Dominion of the Aryans", i.e. of Iranians). An interesting chapter of Iran's history followed after roughly six hundred years of conflict with the Roman Empire. According to historians, the war-exhausted Persians lost the Battle of al-Qādisiyyah (632 CE) in Hilla, (present day Iraq). The Persian general Rostam Farrokhzād had been criticised for his decision to face the Arabs on their own ground, suggesting that the Persians could have prevailed if they had stayed on the opposite bank of the Euphrates. The first day of battle ended with Persian advances and the Arab force appeared as though it would succumb to the much larger Sassanian army. In particular, the latter's elephants terrified the Arab cavalry. By the third day of battle, Arab veterans arrived on the scene and re-enforced the Arab army. In addition a clever trick whereby the Arab horses were decorated in costume succeeded in frightening the Persian elephants. When an Arab warrior succeeded in slaying the lead elephant, the rest fled into the rear, trampelling numerous Persian fighters. At dawn of the fourth day, a sandstorm broke out blowing sand in the Persian army's faces resulting in total disarray for the Sassanian army and paving way for the Islamic conquest of Persia. The Sassanian era, encompassing the length of the Late Antiquity period, is considered to be one of the most important and influential historical periods in Iran, and had a major impact on the world. In many ways the Sassanian period witnessed the highest achievement of Persian civilization, and constituted the last great Iranian Empire before the adoption of Islam. Persia influenced Roman civilisation considerably during the Sassanians times; their cultural influence extending far beyond the empire's territorial borders, reaching as far as Western Europe, Africa, China and India and also playing a prominent role in the formation of both European and Asiatic medieval art. This influence carried forward to the early Islamic world. The dynasty's unique and aristocratic culture transformed the Islamic conquest and destruction of Iran into a Persian Renaissance. Much of what later became known as Islamic culture, architecture, writing and other skills, were taken from the Sassanian Persians into the broader Muslim world. 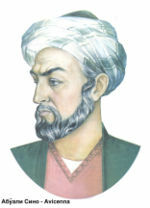 Avicenna (Ibn-Sina) is considered the greatest of the medieval Islamic and Persian physicians. His work directly influenced the Renaissance. 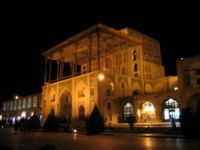 Ali Qapu palace, the celebrated seat of the Safavid in Isfahan, Iran. After the conquest Persians began to look for ways in which they could remain Muslim but also define themselves as Persians and sought the " Persianisation" of Islam. In the 8 CE (2 H) they helped the Abbassids to overthrow the Umayyad Dynasty, an Arab-oriented regime that was largely disdainful towards Persians and Persian culture. Under the Abbasids, Persians (and other non-Arabs) began to take on a more meaningful role in the Islamic Empire's intellectual, cultural, and political realms. Persians entered the Abbassid government as ministers, among those were the Barmakids. They established new dynasties in some parts of Iran, which derived legitimacy from the caliphs. Tahirid dynasty and Samanid dynasty were among those. One of these dynasties ( Buwayhid) also conquered Baghdad. Also a cultural movement emerged during the ninth and tenth centuries. There was a resurgence of Persian national identity. It was not against Islamic identity but against Arabization of Islam and Muslims. The most notable effect of the movement was the decision of the continuation of the Persian language, the language of the Persians to the present day. Ferdowsi, Iran's greatest epic poet, is regarded today as the most important person in maintaining the Persian language. During this period, Persia and Persian scientists created an Islamic Golden Age (see List of Iranian scientists and scholars). Persia was at this point of history a world centre of scientific inquiry, with philosophers, scientists, engineers and historians contributing enormously to technology, science and medicine, later influencing the rise of European science in the Renaissance. The late Middle Ages however brought many critical events in the region. From 1220, Persia was again invaded and destroyed by wave after wave of calamity starting with the Mongol invasion, followed later by Tamerlane. During the Mongol period more than half of the population were killed and didn't reach its pre-Mongol levels until the twentieh century. Persia's first encompassing Shi'a Islamic state was established under the Safavid dynasty in 1501. The Safavid dynasty soon became a major power in the world and started the promotion of tourism in Iran. Under their rule the Persian Architecture flowered again and saw many new monuments. The decline of the Safavid state in the seventeenth century increasingly turned Persia into an arena for rising rival colonial powers such as Imperial Russia and the British Empire that wielded great political influence in Tehran under the Qajarid dynasty. Iran however, managed to maintain its sovereignty and was never colonized, making it unique in the region. With the rise of modernization in the late nineteenth century, desire for change led to the Persian Constitutional Revolution of 1905-1911. In 1921, Reza Khan (known as Reza Shah after assuming the throne) staged a coup against the weakened Qajar dynasty. A supporter of modernization, Reza Shah initiated the development of modern industry, railroads, and establishment of a national education system, but his autocratic rule and unbalanced social reforms created discontent among many Iranians. 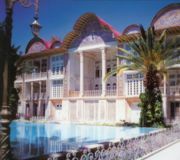 Eram Garden, a famous historic garden built in Shiraz during the Qajar era. During World War II, Britain and the USSR invaded Iran from August 25 to September 17, 1941, to stop an Axis-supported coup and secure Iran's petroleum infrastructure. The Allies forced the Shah to abdicate in favour of his son, Mohammad Reza Pahlavi, whom they hoped would be more supportive. In 1951, an eccentric pro-democratic nationalist, Dr. Mohammed Mossadegh rose to prominence in Iran and was elected its first Prime Minister. 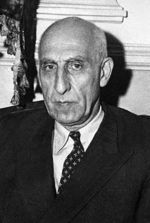 As Prime Minister, Mossadegh alarmed the West by his nationalization of Anglo-Iranian Oil Company (later British Petroleum, BP) that had controlled the country's oil reserves. In response, Britain immediately embargoed Iran. In 1953, members of the British Intelligence Service invited the United States under President Eisenhower to join them in Operation Ajax to overthrow Iran’s democracy. President Eisenhower agreed, authorizing the CIA to take the lead in the operation of overthrowing Mossadegh and reinstalling a US-friendly monarch. The CIA faced many setbacks, but eventually succeeded. Regardless of this setback, the covert operation soon went into full swing, conducted from the US Embassy in Tehran under the leadership of Kermit Roosevelt, Jr.. Agents were hired to facilitate violence; and, as a result, protests broke out across the nation. Anti- and pro-monarchy protestors violently clashed in the streets, leaving almost three hundred dead. The operation was successful in triggering a coup, and within days, pro-Shah tanks stormed the capital and bombarded the Prime Minister's residence. Mossadegh surrendered, and was arrested on 19 August 1953. He was tried for treason, and sentenced to three years in prison. 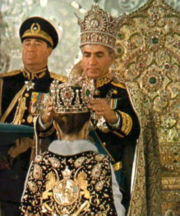 Mohammad Reza Pahlavi, the last Shah of the Iranian Monarchy, crowning Farah Pahlavi as Empress of Iran. Mohammad Reza Pahlavi was then reinstated as Shah. His rule became increasingly autocratic in the following years. With strong support from the US and UK, the Shah further modernized Iranian industry, but simultaneously crushed all forms of political opposition with his intelligence agency, SAVAK. Ayatollah Ruhollah Khomeini became an active critic of the Shah's modernization efforts and publicly denounced the government. Khomeini, who was popular in religious circles, was arrested and imprisoned for 18 months. After his release in 1964, Khomeini publicly criticized the United States government. The Shah was persuaded to send him into exile by General Hassan Pakravan. Khomeini was sent first to Turkey and then to Iraq. While in exile, he continued to denounce the Shah. 1979 saw an increase in protests against the Shah, culminating in the Iranian Revolution. The Shah fled the country again, after which Khomeini returned from exile in France on February 1, 1979 and eventually succeeded in taking power. On February 11, Khomeini declared a provisional government led by prime minster Mehdi Bazargan and on March 30 to March 31, asked all Iranians sixteen years of age and older, male and female, to vote in a referendum on the question of establishing an Islamic republic in Iran. Over 98% voted in favour of replacing the monarchy with the newly-proposed form of government. Khomeini's new Islamic state instated conservative Islamic laws and unprecedented levels of direct clerical rule. Iran's relations with the United States were severely strained after the revolution, especiallly when Iranian students seized US embassy personnel on November 4, 1979, labeling the embassy a "den of spies" and accused its personnel of being CIA agents trying to overthrow the revolutionary government, as the CIA had done to Mohammad Mossadegh in 1953. Khomeini did not stop the students from holding embassy employees hostage and instead supported the embassy take over, a move which only increased his popularity among the revolutionaries. Women, African Americans and one hostage diagnosed with multiple sclerosis were soon released. Despite attempts made by the administration of US President Jimmy Carter at negotiating and rescuing the remaining hostages through such methods as Operation Eagle Claw, Iran refused to release them and threatened to put the hostages on trial for espionage. The students demanded the handover of the shah in exchange for the hostages. However, this exchange never took place, and after 444 days of captivity, embassy employees were finally allowed to leave Iran and return to the United States on the basis of Algiers declaration in which U.S. hasn't released the properties of Iran. Meanwhile, Iraqi leader Saddam Hussein decided to take advantage of what he perceived to be disorder in the wake of the Iranian Revolution and its unpopularity with Western governments. Of particular interest was that the once-strong Iranian military had been disbanded during the revolution. With the Shah out of power, Hussein had far-reaching ambitions to assert himself as the new strong man of the Middle East and planned a full-scale invasion of Iran, boasting that his forces could reach the capital within three days. The Iraqi army's assault took the country completely by surprise and the destructive Iran-Iraq War called "Saddām's al-Qādisiyyah" in Iraq, and the "Imposed war" in Iran had begun. Tens of thousands of Iranian civilians and military personnel were killed when Iraq used chemical weapons in its warfare. Iraq was financially backed by Egypt, the Arab countries of the Persian Gulf, the United States (beginning in 1983), France, the United Kingdom, Germany,and the People's Republic of China (which also sold weapons to Iran) All of these countries provided intelligence, agents for chemical weapons as well as other forms of military assistance to Saddam Hussein. Iran's principal allies during the war were Syria, Libya, North Korea, Cuba and Yugoslavia. Although Saddam Hussein's forces made several early advances, by 1982, Iranian forces managed to push the Iraqi army back into Iraq. Khomeini refused a cease-fire from Iraq which was demanding huge reparation payments and an end to his rule. Khomeini also sought to export his Islamic revolution westward into Iraq, especially on the majority Shi'a Arabs living in the country. The war then continued for six more years until 1988, when Khomeini, in his words, "drank the cup of poison" and accepted a truce mediated by the United Nations. With the fall of Saddam's regime in Iraq in April 2003 and his capture in December of that year, Iran announced it had sent its own indictment against Saddam to Iraq's government, with the list of complaints including the use of chemical weapons. The total Iranian casualties of the war were estimated to be anywhere between 500,000 to 1,000,000. Almost all relevant international agencies have confirmed Saddams chemical warfare to blunt Iranian human wave attacks, while unanimously announcing that Iran never used chemical weapons during the war. Iran is a founding member of the United Nations organization and also a member of the Organization of the Islamic Conference and the Non-Aligned Movement. The political system of the Islamic Republic is based on the 1979 Constitution called the "Qanun-e Asasi" ("Fundamental Law"). The system comprises several intricately connected governing bodies. The Supreme Leader of Iran is responsible for delineation and supervision of "the general policies of the Islamic Republic of Iran". The Supreme Leader is Commander-in-Chief of the armed forces, controls the military intelligence and security operations; and has sole power to declare war. The heads of the judiciary, state radio and television networks, the commanders of the police and military forces and six of the twelve members of the Council of Guardians are appointed by the Supreme Leader. The Assembly of Experts elects and dismisses the Supreme Leader on the basis of qualifications and popular esteem. The Assembly of Experts is responsible for supervising the Supreme Leader in the performance of legal duties. After the Supreme Leader, the Constitution defines the President as the highest state authority. The President is elected by universal suffrage for a term of four years. Presidential candidates must be approved by the Council of Guardians prior to running in order to ensure their allegiance to the ideals of the Islamic revolution. The President is responsible for the implementation of the Constitution and for the exercise of executive powers, except for matters directly related to the Supreme Leader, who has the final say in all matters. The President appoints and supervises the Council of Ministers, coordinates government decisions, and selects government policies to be placed before the legislature. Eight Vice-Presidents serve under the President, as well as a cabinet of twenty-one ministers, who must all be approved by the legislature. Unlike many other states, the executive branch in Iran does not control the armed forces. Although the President appoints the Ministers of Intelligence and Defense, it is customary for the President to obtain explicit approval from the Supreme Leader for these two ministers before presenting them to the legislature for a vote of confidence. The Council of Guardians comprises twelve jurists including six appointed by the Supreme Leader. The head of the judiciary, who is also appointed by the Supreme Leader, recommends the remaining six, who are officially appointed by Parliament. The Council interprets the constitution and may veto Parliament. If a law is deemed incompatible with the constitution or Sharia (Islamic law) , it is referred back to Parliament for revision. In a controversial exercise of its authority, the Council has drawn upon a narrow interpretation of Iran's constitution to veto parliamentary candidates. The Majles-e Shura-ye Eslami (Islamic Consultative Assembly) is comprised of 290 members elected for four-year terms. The Majlis drafts legislation, ratifies international treaties, and approves the national budget. All Majlis candidates and all legislation from the assembly must be approved by the Council of Guardians. Before the Islamic Revolution, Iran's legislature was bicameral with both the Majlis and a Senate; the Senate was eliminated in the 1979 constitution. The Supreme Leader appoints the head of the Judiciary, who in turn appoints the head of the Supreme Court and the chief public prosecutor. There are several types of courts including public courts that deal with civil and criminal cases, and "revolutionary courts" which deal with certain categories of offenses, including crimes against national security. The decisions of the revolutionary courts are final and cannot be appealed. The Special Clerical Court handles crimes allegedly committed by clerics, although it has also taken on cases involving lay people. The Special Clerical Court functions independently of the regular judicial framework and is accountable only to the Supreme Leader. The Court’s rulings are final and cannot be appealed. After the revolution, Shahyad Tower was renamed to Azadi Tower (Freedom Tower). The Assembly of Experts, which meets for one week annually, comprises 86 "virtuous and learned" clerics elected by adult suffrage for eight-year terms. As with the presidential and parliamentary elections, the Council of Guardians determines candidates' eligibility. The Assembly elects the Supreme Leader and has the constitutional authority to remove the Supreme Leader from power at any time. The Assembly has never been known to challenge any of the Supreme Leader's decisions. Local councils are elected by public vote to four-year terms in all cities and villages of Iran. 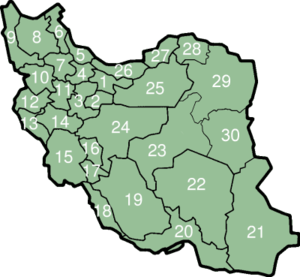 According to article seven of Iran's Constitution, these local councils together with the Parliament are "decision-making and administrative organs of the State". This section of the constitution was not implemented until 1999 when the first local council elections were held across the country. Councils have many different responsibilities including electing mayors, supervising the activities of municipalities; studying the social, cultural, educational, health, economic, and welfare requirements of their constituencies; planning and co-ordinating national participation in the implementation of social, economic, constructive, cultural, educational and other welfare affairs. Mount Damavand is highest point of Iran and the Middle East. Hills south west of Sanandaj near the village of Kilaneh, Kurdistan Province. Iran is the seventeenth-largest country in the world. Its area roughly equals the size of the United Kingdom, France, Spain, and Germany combined, one-fifth the size of the United States or roughly the size of the state of Alaska. Its borders are with Azerbaijan (432 km/268 mi) and Armenia (35 km/22 mi) to the northwest; the Caspian Sea to the north; Turkmenistan (992 km/616 mi) to the northeast; Pakistan (909 km/565 mi) and Afghanistan (936 km/582 mi) to the east; Turkey (499 km/310 mi) and Iraq (1,458 km/906 mi) to the west; and finally the waters of the Persian Gulf and the Gulf of Oman to the south. Iran's area is 1,648,000 km² (approximately 636,300 mi²), of which 1,636,000 km² (approx. 631,663 mi²) is land and 12,000 km² (approx. 4,633 mi²) is water. Iran is one of the world's most mountainous countries, its landscape is dominated by rugged mountain ranges that separate various basins or plateaus from one another. The populous western part is the most mountainous, with ranges such as the Caucasus, Zagros and Alborz Mountains; the latter contains Iran's highest point, Mount Damavand at 5,604 m (18,386 ft), which is not only the country's highest peak but also the highest mountain on the Eurasian landmass west of the Hindu Kush. The eastern part consists mostly of desert basins like the saline Dasht-e Kavir, and some salt lakes. Except for some scattered oases, these deserts are uninhabited. The only large plains are found along the coast of the Caspian Sea and at the northern end of the Persian Gulf, where Iran borders the mouth of the Arvand river. Smaller, discontinuous plains are found along the remaining coast of the Persian Gulf, the Strait of Hormuz and the Sea of Oman. Iran's climate is mostly arid or semiarid, to subtropical along the Caspian coast. On the northern edge of the country (the Caspian coastal plain) temperatures nearly fall below freezing and remain humid for the rest of the year. Summer temperatures rarely exceed 29 °C (84 °F). Annual precipitation is 680 mm (27 in) in the eastern part of the plain and more than 1,700 mm (67 in) in the western part. To the west, settlements in the Zagros Mountains basin experience lower temperatures, severe winters, sub-freezing average daily temperatures and heavy snowfall. The eastern and central basins are arid, with less than 200 mm (eight in) of rain and have occasional desert. Average summer temperatures exceed 38°C (100°F). The coastal plains of the Persian Gulf and Gulf of Oman in southern Iran have mild winters, and very humid and hot summers. The annual precipitation ranges from 135 to 355 mm (five to fourteen inches). A building on a busy commercial street in Tehran. An Iran Air Boeing 747-200. Iran's economy is a mixture of central planning, state ownership of oil and other large enterprises, village agriculture, and small-scale private trading and service ventures. Its economic infrastructure has been improving steadily over the past two decades. In the early 21st century the service sector contributed the largest percentage of the GDP, followed by industry ( mining and manufacturing) and agriculture. About 45 percent of the government's budget came from oil and natural gas revenues, and 31 percent came from taxes and fees. Government spending contributed to an average annual inflation rate of 14 percent in the period 2000-2004. In 2004 the GDP was estimated at $163 billion, or $2,440 per capita ($8,100 at PPP). Because of these figures and the country’s diversified but small industrial base, the United Nations classifies Iran's economy as semideveloped. The current administration continues to follow the market reform plans of the previous one and indicated that it will diversify Iran's oil-reliant economy. It is attempting to do this by investing revenues in areas like automobile manufacturing, aerospace industries, consumer electronics, petrochemicals and nuclear technology. Iran also expects to attract billions of dollars of foreign investment by creating a more favorable investment climate, such as reduced restrictions and duties on imports, and free-trade zones like in Chabahar and the island of Kish. Modern Iran has a solid middle class and a growing economy but continues to be affected by inflation and unemployment. Iranian budget deficits have been a chronic problem, in part due to large-scale state subsidies (totaling some $7.25 billion per year) that include foodstuffs and especially gasoline. Iran is OPEC's second largest oil producer, exporting over three million barrels of oil per day; moreover, it holds 10% of the world's confirmed oil reserves. Iran also has the world's second largest natural gas reserves (after Russia). The strong oil market in 1996 helped ease financial pressures on Iran and allowed for Tehran's timely debt service payments. The services sector has seen the greatest long-term growth in terms of its share of GDP, but the sector remains volatile. State investment has boosted agriculture with the liberalization of production and the improvement of packaging and marketing helping to develop new export markets. Thanks to the construction of many dams throughout the country in recent years, large-scale irrigation schemes, and the wider production of export-based agricultural items like dates, flowers, and pistachios, produced the fastest economic growth of any sector in Iran over much of the 1990s. Although successive years of severe drought in 1998, 1999, 2000 and 2001 have held back output growth substantially, agriculture remains one of the largest employers, accounting for 22% of all jobs according to the 1991 census. Iran has also developed a biotechnology, nanotechnology, and pharmaceuticals industry. For energy, it currently relies on conventional methods, but as of March 2006, uranium refinement, the last major hurdle to developing nuclear power, was revealed to have taken place. Iran's major commercial partners are China, Russia, Germany, France, Italy, Japan and South Korea. Since the late 1990s, Iran has increased its economic cooperation with other developing countries, including Syria, India, Cuba, Venezuela, and South Africa. Iran is also expanding its trade ties with Turkey and Pakistan and shares with its partners the common goal of creating a single economic market in West and Central Asia, much like the European Union. Iran is a diverse country consisting of people of many religions and ethnic backgrounds cemented by the Persian culture. 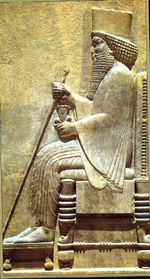 Persians, the founders of Ancient Persia, constitute the majority of the population. Seventy percent of present-day Iranians are Iranic peoples, native speakers of Indo-European languages who are descended from the Aryan ( Indo-Iranians) tribes that began migrating from Central Asia into what is now Iran in the second millennium BC. The majority of the population speaks one of the Iranian languages, including the official language, Persian ( Farsi). The main ethnic groups are Persians (51%), Azeris (24%), Gilaki and Mazandarani (8%), Kurds (7%), Arabs (3%), Baluchi (2%), Lurs (2%), Turkmens (2%), Qashqai, Armenians, Persian Jews, Georgians, Assyrians, Circassians, Tats, Pashtuns and others (1%). The number of native speakers of Persian in Iran is estimated at around 40 million. However, the Iranian languages and their various dialects (totaling an estimarted 150-200 million speakers) exceed the Iranian borders and are spoken throughout western China, southern Russia, and eastern Turkey. Iran's population increased dramatically during the latter half of the twentieth century, reaching about 70 million by 2006. In recent years, Iran appears to have taken control of its high population growth rate and many studies show that Iran's population growth rate will continue to decline until stabilizing by the year 2050 at around 100 million. More than two-thirds of the population are under the age of 30, and the literacy rate is 80%. The Iranian diaspora is estimated at over three million people who emigrated to North America, Europe, South America and Australia, mostly after the Iranian revolution in 1979. Iran also hosts one of the largest refugee populations in the world, with more than one million refugees, mostly from Afghanistan and Iraq. As recent as October 10, 2006, Iranian officials have been working hand in hand with the UNHCR and Afghani officials to furthur is official government policy of repatriation. Most Iranians are Muslims; 90% belong to the Shi'a branch of Islam, the official state religion, and about 8% belong to the Sunni branch, many Kurds. The remaining 2% are non-Muslim religious minorities, mainly Bahá'ís, Mandeans, Hindus, Zoroastrians, Jews, and Christians. The latter three minority religions are officially recognized and protected, and have reserved seats in the Majles (Parliament). However the Bahá'í Faith, Iran's largest religious minority, is not officially recognized, and has been persecuted during its existence in Iran. Since the 1979 revolution the persecution has increased with executions and the denial of access to higher education. More recent persecution towards Bahá'ís has led to the United Nations Special Rapporteur of the United Nations Commission on Human Rights stating on March 20, 2006 that "this latest development indicates that the situation with regard to religious minorities in Iran is, in fact, deteriorating." Iran has one of the highest urban-growth rates in the world. From 1950 to 2002 the urban proportion of the population increased from 27% to 60%. The United Nations predicts that by 2030 the urban population will form 80% of the overall population. Most of the internal migrants have settled near the cities of Tehran, Isfahan, Ahwaz, and Qom. Tehran is the largest city with 7,160,094 inhabitants ( metropolitan: 14,000,000). More than half of the country's industry is based there. Industries include the manufacturing of cars, electronics and electrical equipment, military weaponry, textiles, sugar, cement, and chemical products. Mashhad, one of the holiest Shi'a cities, is the second largest city with a population of 2.8 million. Iran has a long history of art, music, architecture, poetry, philosophy, traditions, and ideology. Miniature painting by Mohammad Tajvidi on the cover of the Divan of Hafez ("Hafez's Anthology"), published 1969. Iranian culture has long been the predominant culture of the Middle East and Central Asia, with Persian considered the language of intellectuals during much of the second millennium AD. Nearly all philosophical, scientific, or literary work of the Islamic empires was written in or translated to Persian, as well as Arabic. The Islamic conquest of Iran during the first half of the seventh century began a synthesis of the Arabic and Iranian tongues. By the tenth century, this cultural diffusion threatened to erase native Persian entirely, as many Persian writers, scientists, and scholars elected to write in the language of the Qur'an (Arabic) (see List of Iranian scientists and scholars). Moreover, Islamic caliphate was largely disdainful towards Persians and Persian culture more specifically during the rule of first caliphate dynasty of Umayyads who vividly sought Arabic supremacy in all aspects of their empire. This prompted Ferdowsi to compose the Shahnameh (Persian: Book of Kings), Iran's national epic from its legendary prehistoric nascence till its defeat at the battle of al-Qādisiyyah. It was written entirely in Persian. This gave rise to a strong reassertion of Iranian national identity, and is in part responsible for the continued existence of Persian as a separate language. Cinema has continued to thrive in modern Iran, and many Iranian directors have garnered worldwide recognition for their work. (Iranian movies have won over three hundred awards in the past twenty-five years.) One of the best-known directors is Abbas Kiarostami. The Iranian media is a mixture of private and state-owned, but books and movies must be approved by the Ministry of Culture and Islamic Guidance before being released to the public. The state also actively monitors the Internet, which has become enormously popular among the Iranian youth. Iran is now the world's fourth largest country of bloggers. The quest for social justice and equity is an important Iranian cultural trait. The Cyrus Cylinder is considered the world's first declaration of human rights, and was the basis of government for the Achaemenid dynasty. 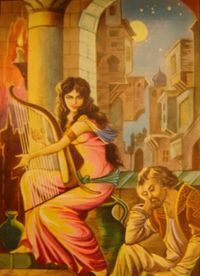 Equality of the sexes also has a strong historical precedent in Iran: from the Achaemenid to Sassanid dynasties, women were encouraged to pursue an education and study at universities; they held property, influenced the affairs of state, and worked and received the same compensation as men. Today, women compose more than half of the incoming classes for universities around the country. Respect for the elderly and hospitality for foreigners are also an integral part of Iranian etiquette. The Iranian New Year ( Norouz) is celebrated on March 21 from Spain in the west to Kazakhstan in the east. It is celebrated as the first day of spring. Norouz was nominated as one of UNESCO's Masterpieces of the Oral and Intangible Heritage of Humanity in 2004. According to the Iranian Constitution, the government is required to provide every citizen of the country with access to social security that covers retirement, unemployment, old age, disability, accidents, calamities, health and medical treatment and care services. This is covered by public revenues and income derived from public contributions. In its 2000 report on national healthcare systems, the World Health Organization ranks Iran's overall healthcare system performance as 93rd among the world's nations. The health status of Iranians has improved over the last two decades. Iran has been able to extend public health preventive services through the establishment of an extensive Primary Health Care network. As a result child and maternal mortality rates have fallen significantly, and life expectancy at birth has risen remarkably. Infant (IMR) and under-five (U5MR) mortality have decreased to 28.6 and 35.6 per 1,000 live births respectively in 2000, compared to an IMR of 122 per 1,000 and an U5MR of 191 per 1,000 in 1970..
An eighteenth-century Persian astrolabe. Throughout the Middle Ages, the natural philosophy and mathematics of the ancient Greeks and Persians were furthered and preserved within Persia. 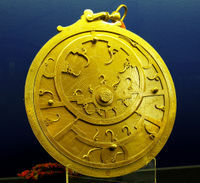 During this period, Persia became a centre for the manufacture of scientific instruments, retaining its reputation for quality well into the nineteenth century. Science in Iran, as the country itself, has a long history. 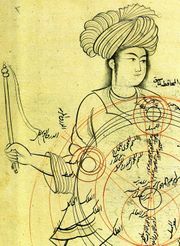 Iranians contributed significantly to the current understanding of astronomy, nature, medicine, mathematics, and philosophy. To mention just a few, Persians first discovered Algebra, invented the wind mill and found medical uses of alcohol. In present times, scientists in Iran are trying to revive the golden age of Persian science. Iran has increased its publication output nearly tenfold from 1996 through 2004, and has been ranked first in terms of output growth rate followed by China. Theoretical and computational sciences are rapidly developing in Iran. Theoretical physicists and chemists are regularly publishing in high impact factor journals. Despite the limitations in funds, facilities, and international collaborations, Iranian scientists remain highly productive in several experimental fields as pharmacology, pharmaceutical chemistry, organic chemistry, and polymer chemistry. Iranian scientists are also helping construct the Compact Muon Solenoid, a detector for CERN's Large Hadron Collider due to come online in 2007. Iranian Biophysicists (especially molecular biophysics) have gained international reputation since the 1990s. High field NMR facilities, as well as Microcalorimetry, Circular dichroism, and instruments for single protein channel studies have been provided in Iran during recent decades. Tissue engineering and research on biomaterials have just started to emerge in biophysics departments. In late 2006, Iranian scientists cloned successfully a sheep, by somatic cell nuclear transfer, at the Rouyan research centre in Isfahan. Iranian history boasts the first charter of human rights ; the Persian Empire (Iran) established unprecedented principles of human rights in the 6th century BCE. Since then, the status of human rights in Iran has varied dramatically. Today, the violation of human rights by the Islamic Republic of Iran continues to be significant, despite many efforts by Iranian human right activists, writers, NGOs and some political parties. Human rights in Iran regularly faces the issues of governmental impunity, restricted freedom of speech, and gender inequality. According to Human Rights Watch, respect for human rights in Iran, especially freedom of expression and opinion, deteriorated considerably in 2005. The government routinely uses torture and ill-treatment in detention, including prolonged solitary confinement, to punish dissidents. The judiciary, which is accountable to Supreme Leader Ali Khamenei, has been at the centre of many serious human rights violations.